President Obama’s plan to essentially freeze most deportations for people who are resident and working in the United States would protect as many as 4.4 million people and their families. Nearly two million others are already shielded from deportation by the Deferred Action for Childhood Arrivals (DACA) policy, which will continue. The president’s proposals have been generally warmly received by major Catholic bodies with the consistent caution that this latest effort to rationalize the nation’s immigration policies remains far from complete and still leaves too many undocumented people out. 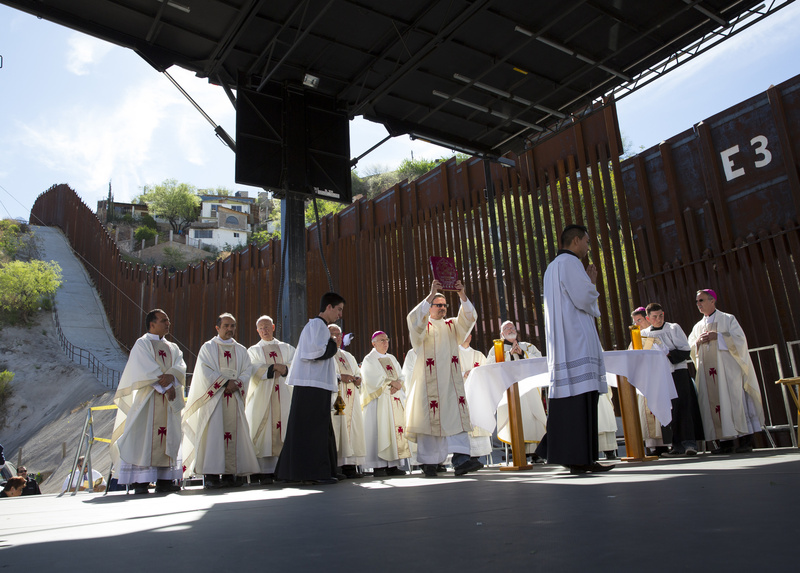 Generous family reunification policies have been a consistent demand by the U.S. bishops and other Catholic agencies concerned with immigration. Bishop Eusebio Elizondo, M.Sp.S., auxiliary bishop of Seattle and chairman of the U.S. Conference of Catholic Bishops (USCCB) Committee on Migration, welcomed the Obama administration's proposals today in a statement. “We have a long history of welcoming and aiding the poor, the outcast, the immigrant and the disadvantaged,” he said, in a statement released on behalf of the U.S. bishops. “Each day, the Catholic Church in the United States, in her social service agencies, hospitals, schools, and parishes, witnesses the human consequences of the separation of families, when parents are deported from their children or spouses from each other,” Bishop Elizondo said. “We’ve been on record asking the administration to do everything within its legitimate authority to bring relief and justice to our immigrant brothers and sisters. As pastors, we welcome any efforts within these limits that protect individuals and protect and reunite families and vulnerable children." A CRS statement pointed out that undocumented migration will likely continue because of persisting insecurity in Honduras, Guatemala and El Salvador—known as the Northern Triangle—whatever policy is made in the United States. That migration of unaccompanied youth, some as young as 5 years of age, has been driven certainly by the region’s poverty but also by increasingly violent and sophisticated street gangs, often colluding with narco-traffickers. As a result, according to CRS, many undocumented immigrants’ children, nieces and nephews now see no alternatives but to make the trek to join their families; a trek that has become only more dangerous. Migrants and refugees navigating through Mexico today often suffer extortion, kidnapping, sexual assault, robbery, and some are caught up in trafficking. House Republicans criticized the administration's efforts to jump start immigration reform—a legislative package, approved by the Senate, has been stalled for almost two years in the GOP-controlled House of Representatives—as "executive amnesty" and a possibly unconstitutional presidential overreach. U.S. Representative Paul Ryan was confirmed by Republicans on Wednesday as chairman of the powerful Ways and Means Committee overseeing government funding and taxes beginning in January when the new Congress takes office. Ryan told Reuters that Obama's immigration plan was a "partisan bomb" that would hamper any effort to work with Congress on tax reform and other issues. Asked to comment on the allegation that the president's proposal is little more than a hidden amnesty program for people who have broken U.S. law by entering the country without documentation or overstaying visas, O'Keefe responded, "We are not rewarding people who broke the law, but admitting the truth that we drove people here through our own need for low wage labor, our own trade policies that made it harder for people to live a decent life in their home country, our own support to unjust regimes and destabilizing conflicts." He added, "If a two- to three-year reprieve from deportation is a reward for people who have been here working, raising families and paying taxes for years, what is punishment?" A Catholic Charities USA (CCUSA) statement called the president’s moves to freeze most deportations “an important step towards protecting immigrants and strengthening families,” adding, “the decision moves our nation closer towards creating a society in which authentic human dignity is recognized, families are strengthened, and all, regardless of creed, race, or background, are welcomed as full members of our community. The Franciscan Action Network “applauds this first step that the President took, and thanks him for putting the importance of the lives of millions of people over political games.” A FAN statement adds, “We now call on Congress to provide relief for the millions of families who will still be broken apart by deportation and are looking for an earned path to citizenship such as family members not covered under DACA and farm workers who toil in our fields every day. “As people of faith, we're called to love our neighbor and welcome the stranger. We have a moral obligation to stand with our immigrant sisters and brothers. As Pope Francis stated recently ahead of the World Day of Migrants and Refugees: 'Jesus Christ is always waiting to be recognized in migrants and refugees, in displaced persons and in exiles, and through them he calls us to share our resources, and occasionally to give up something of our acquired riches.'" The Church finds its voice, the Kingdom of God comes closer and the trolls come out in force.